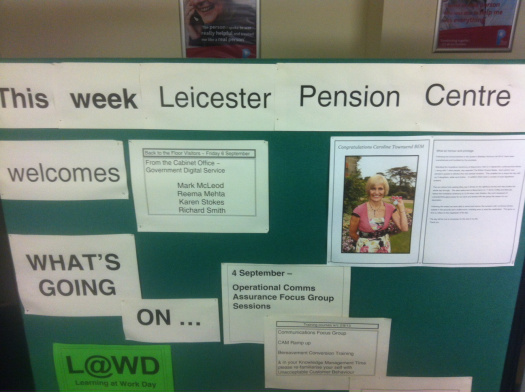 Last week, Mark McLeod, Richard Smith and I visited Leicester Pension Service. 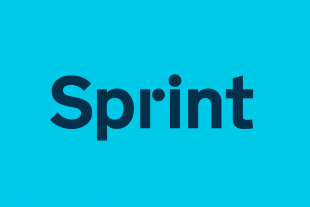 We wanted to see first-hand how a major transactional government service operates, hear from front-line staff, and find out more about the needs of older users (who are more likely to be offline). Leicester Pension Service is part of the Department for Work and Pensions (DWP). It administers State Pension and Pension Credit applications to customers living in South Lincolnshire, Leicestershire, Northamptonshire, Nottinghamshire and parts of Warwickshire. Leicester also delivers the DWP Bereavement Service to people residing in its geographic area. The State Pension and Bereavement services are relatively simple transactions, with the former taking an average of 20 minutes to process and administer over the phone. By contrast, the Pension Credit service is highly complex, requiring the customer to provide a wide range of personal information and post supporting documentation as proof. At the start of the day, we met with Nigel Kimpton, the Site Manager, who gave us an overview of business. He explained that all work in the centre is conducted over the phone or through a single online system. Next we met managers and staff from teams across the centre. Those working on processing benefit claims appreciated being able to manage cases through the online system, which allowed them to see all their cases at once, view and update all the information related to a case in one place, and share information easily with colleagues working on the same case. The staff we spoke to were highly professional and empathetic. They had to balance providing a quality service to customers with resolving cases efficiently and effectively. We ended the day by speaking to people working in capacity planning for the centre. This is a complex and highly data-driven task, involving using historical information about call volumes to plan the resource needed to staff the centre’s phone lines. Thanks to Nigel and his team for arranging such an interesting and productive trip for us. The day was a great reminder of how important it is to hear from those involved in the practicalities of service delivery when designing a truly user-centred service. We hope to find and share more great examples of how government already supports people who are offline or have low digital skills. We'll be writing about these on our new assisted digital blog on GOV.UK, where you can also find news and updates about all of our work. This sounds like a very well organised operation. I have personal experience of DVLA service and have found it to be very good. Glad to hear the staff are balancing good customer service with efficiency and effectiveness. Always need to look at the whole business process because poor customer service drives complaints and rework that leads to inefficiency, not all organisations look at the total process and end up with 'efficient' transactions that add up to bad customer experience and bad taxpayer value.